As part of the The Old Schoolhouse Crew I received a book from Zoe & Sozo Publishing for review. 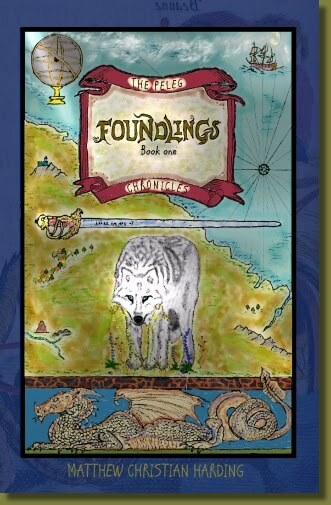 Foundlings is Book 1 in their Peleg Chronicles by Matthew Christian Harding. Book 2 - Paladins - is also available on their website(with free shipping! ), Amazon or Barnes @ Noble. Each book is $11.95. The third book in the series is tentatively scheduled for release by May 2011 with unit studies and lapbooks anticipated for the following year. The site is full of information - not only on the series but on the historical and Biblical context of the story. My boys do not care for any sort of fiction but we did read the story aloud as part of our literature lessons. As the site clearly states this book contains no magic, no humanism and no evolution. Set in the time period following the Tower of Babel, our heroes - and there is at least one character that the reader can easily identify with - are followers of the 'God of Noah'. This makes them a target for those who worship other gods - The Dragon Priests - in fact the story opens with Lord McDougal - one of our two main heroes - being cursed by the only mention of a witch in the story. McDougal is the sole survivor of his family and is accompanied by his faithful servant and shield bearer - Fergus Leatherhead. McDougal is a good-natured brave giant and follower of God. He feels duty bound to help other followers of the God of Noah and Fergus is pulled along on his adventures somewhat reluctantly. Our young hero is named Thiery. He is also a follower of the God of Noah. He is targeted by The Dragon Priests. They consider the followers of the God of Noah good sacrifices to their false god. Thiery's companions include Oded, Suzie and his wolf, Horatio. After escaping an attempt on his life by the Dragon Priests, Theiry winds up in a cave reading the Book of Job and thus deepens his faith in the God of Noah. McDougal and Fergus wind up saving the life of a dwarf named Gimcrack who tells them of Thiery. Mc Dougal is convicted that he must go to Theiry's aid. I found this story charming and even though the boys never did quite get interested it is no reflection on the writer. Fiction does not interest my fact based boys. I am planning on ordering the second in the series as this story ended in a cliff hanger and I really would like to know what happens next. The story is fast paced without being rushed and the descriptions are vivid without being tedious. The story was quite Biblically based. I highly recommend this series for anyone - young or old - (the suggested age is 10 and up) who enjoys this type of fiction. I enjoyed this book too. But I need to get your guys' mind-set. I'm a terrible non-fiction reader and often put them down and forget about them!